BRIEFS ACTIVITIES & APPOINTMENTS Kate Brannelly, FSMPS, has joined CTLGroup as the firm's director of marketing & business development. Brannelly brings a broad range of marketing, com- munications and business development expertise to the firm, along with experience in the client-focused Practice Group marketing concept employed by CTLGroup. She will partner with the firm's Practice Group Chairs to lead the marketing and business development plans for each of their market segments. In this role, she will be respon- sible for the development and implementa- tion of CTLGroup's firm-wide business development and promotion strategies, and will actively participate in determining the strategic direction of the firm as a member of the senior management team. 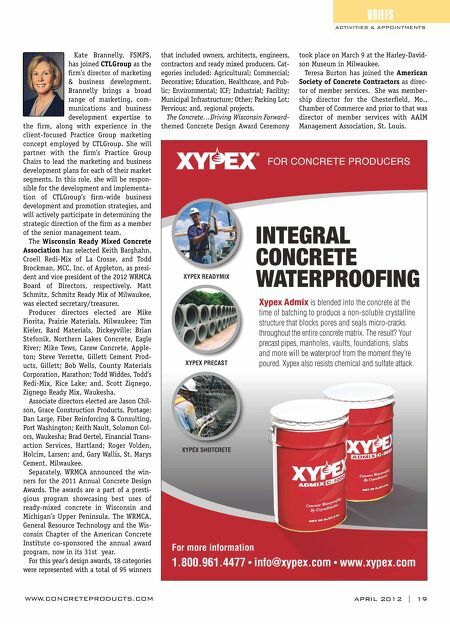 The Wisconsin Ready Mixed Concrete Association has selected Keith Barghahn, Croell Redi-Mix of La Crosse, and Todd Brockman, MCC, Inc. of Appleton, as presi- dent and vice president of the 2012 WRMCA Board of Directors, respectively. Matt Schmitz, Schmitz Ready Mix of Milwaukee, was elected secretary/treasurer. Producer directors elected are Mike Fiorita, Prairie Materials, Milwaukee; Tim Kieler, Bard Materials, Dickeyville; Brian Stefonik, Northern Lakes Concrete, Eagle River; Mike Tews, Carew Concrete, Apple- ton; Steve Verrette, Gillett Cement Prod- ucts, Gillett; Bob Wells, County Materials Corporation, Marathon; Todd Widdes, Todd's Redi-Mix, Rice Lake; and, Scott Zignego, Zignego Ready Mix, Waukesha. Associate directors elected are Jason Chil- son, Grace Construction Products, Portage; Dan Large, Fiber Reinforcing & Consulting, Port Washington; Keith Nault, Solomon Col- ors, Waukesha; Brad Oertel, Financial Trans- action Services, Hartland; Roger Volden, Holcim, Larsen; and, Gary Wallis, St. Marys Cement, Milwaukee. 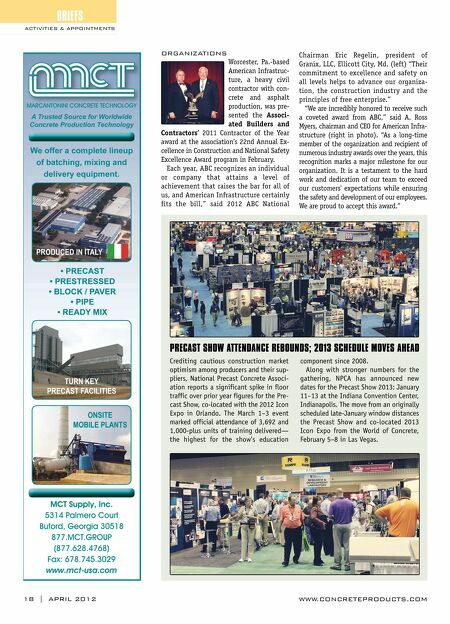 Separately, WRMCA announced the win- ners for the 2011 Annual Concrete Design Awards. The awards are a part of a presti- gious program showcasing best uses of ready-mixed concrete in Wisconsin and Michigan's Upper Peninsula. The WRMCA, General Resource Technology and the Wis- consin Chapter of the American Concrete Institute co-sponsored the annual award program, now in its 31st year. For this year's design awards, 18 categories were represented with a total of 95 winners WWW.CONCRETEPRODUCTS.COM APRIL 2012 | 19 that included owners, architects, engineers, contractors and ready mixed producers. Cat- egories included: Agricultural; Commercial; Decorative; Education, Healthcare, and Pub- lic; Environmental; ICF; Industrial; Facility; Municipal Infrastructure; Other; Parking Lot; Pervious; and, regional projects. The Concrete…Driving Wisconsin Forward- themed Concrete Design Award Ceremony took place on March 9 at the Harley-David- son Museum in Milwaukee. Teresa Burton has joined the American Society of Concrete Contractors as direc- tor of member services. She was member- ship director for the Chesterfield, Mo., Chamber of Commerce and prior to that was director of member services with AAIM Management Association, St. Louis.